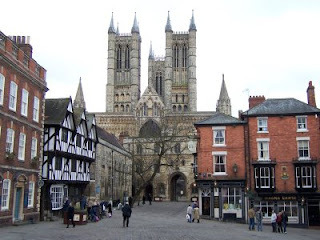 These days, like Stamford, Lincoln is off the beaten track - geographically rather isolated and beyond commuting distance to any larger cities, there doesn't appear to be any obvious or outstanding reason choose Lincoln as a destination over, say York or any other cathedral city. Which is strange when you think that it used to be on *the* main Roman London to York road - otherwise known as Ermine Street. Lincoln was established in Roman times, but it was the Normans who singled it out and made their mark on what actually remains an undeniably charming and historically impressive city. Following the Norman Conquest in 1066, William the Conqueror spearheaded a major building programme which established Lincoln as the administrative centre of the largest diocese in medieval England - a diocese which, for over 800 years, stretched all the way from the Thames to the Humber. The three great towers of the cathedral can be seen from nearly 30 miles away and absolutely dominate the city skyline. It's not difficult to see why the Norman invaders chose this hilltop location on which to establish their new rule; the Saxon peasants who occupied the lower ground would have got the message loud and clear. 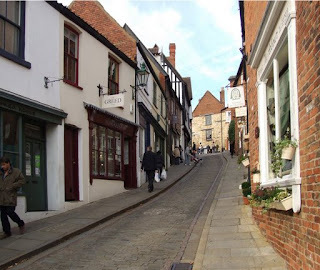 Having enjoyed a wander round the quiet streets of the medieval cathedral quarter, Steep Hill was a much more pleasant experience in the descent. With plenty of oxygen circulating, the magnificent views were the only thing taking my breath away. 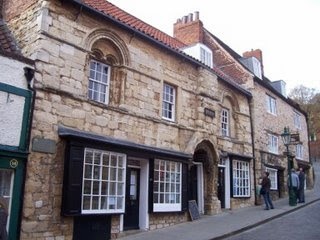 Second hand books and antiques shops and sweet little boutiques line the street, alongside the Jew's House which is thought to be one of Britain's oldest residental buildings.